Ridgefield Friends Unite After Nearly 60 Years! It's been a long time since these neighborhood boys were running through backyards and riding bikes, but birthdays are always a good reason to relive old times. 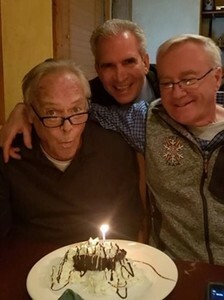 Today, happily celebrating after all these years were Bob Kiley, Richard Hastings and David Kiley, childhood friends for nearly 60 years. That's a lot of laughs … and trouble! Happy birthday, Bob!